1. Inventory what you have on hand. This was something I never used to do and my daughter can attest that I sometimes bought more than one jar of pepperoncini because I didn’t know I had one at home. We are all guilty of this, but if time allows, do a quick check. 2. Create a list of items that you need. 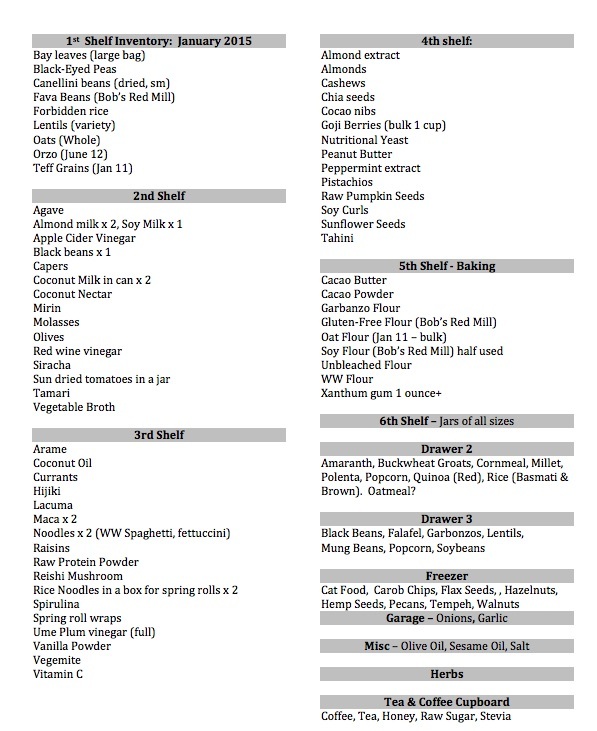 OK, I must admit, after getting into bulk buying and minimalism, I now have a list of what’s in my cupboards. I can print up a list and circle what I need or I can collect the empty containers that are labeled. This actually combines steps one and two. Or when the list is shorter, I just write it out by hand. 3. Gather containers. I keep most of my light containers in the car along with my grocery sacks. I have mesh bags for produce I buy in multiples, such as lemons, avocados, apples. I don’t bag my larger produce items such as lettuce, kale, celery, I just put them in the cart. 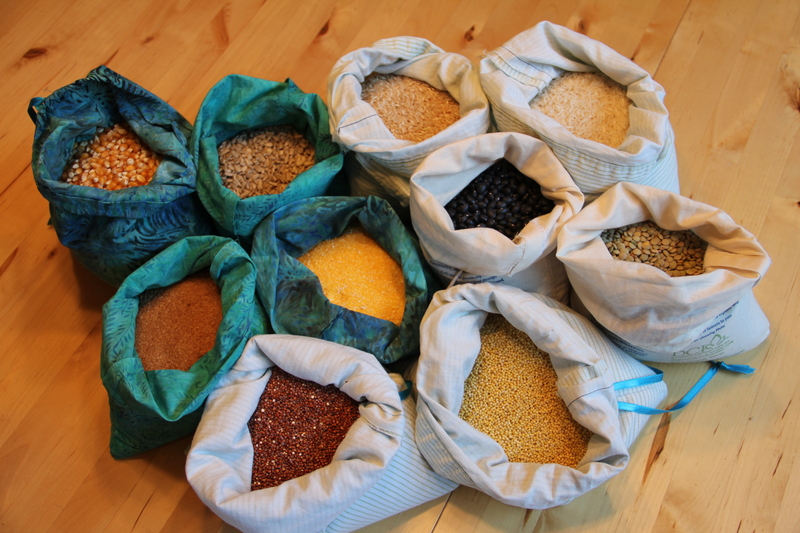 I have cloth bags for the bulk bins and use them for grains, beans, raw sugar, flour, cat food and such. I have a collection of about 12 baby formula bottles that work well for my spice purchases. I bring other empty bottles and I am starting to have dedicated bottles for liquids (think olive oil, tahini, maple syrup, apple cider vinegar) and fine powders (such as cacao powder and tea). 4. Bring the containers into the store. I must admit I adore food co-ops and in Portland I shop at Food Front, for their good selection, great produce and nice people. I also get a few items at People’s Co-op that are not yet available at Food Front, such as Real Salt in bulk, frozen berries and veggies in bulk, and nut milks in bulk. It’s pretty cool if I do say so myself how many items can be purchased in bulk. 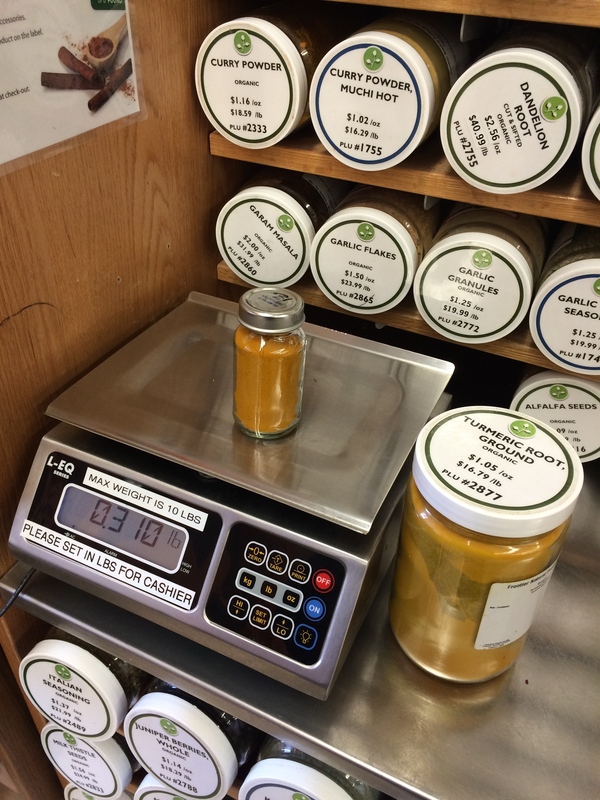 Food coops know how to handle bulk purchases and bringing your own containers, whereas some grocery stores are not yet used to that idea. 5. 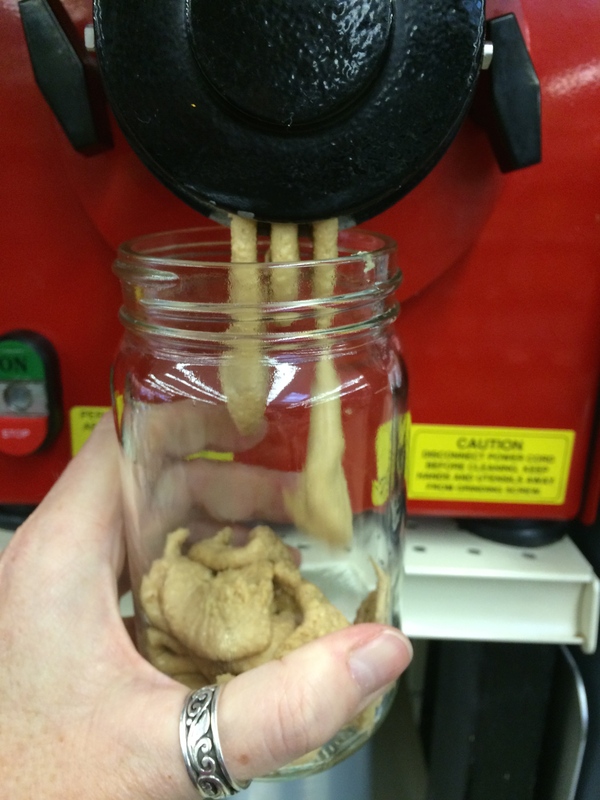 Weight your empty containers. Sometimes you can weigh your own, other times they like the clerks to do that for you, so ask if it is your first time. Once you have the weight, mark it on the container as the tare weight which will be deducted from the price. I usually put “T=0.08” to indicate that’s my container’s weight. I know all my bags of a certain color are 0.04 and my larger bags are 0.08, my spice bottles are 0.21, so having multiples of the same size is helpful. 6. Fill up your containers, and as you do, put the product codes on the containers. This allows the clerks to identify what’s inside and charge you the correct fee. It’s taking the place of labels and stickers that are on all other packaged items in the store. 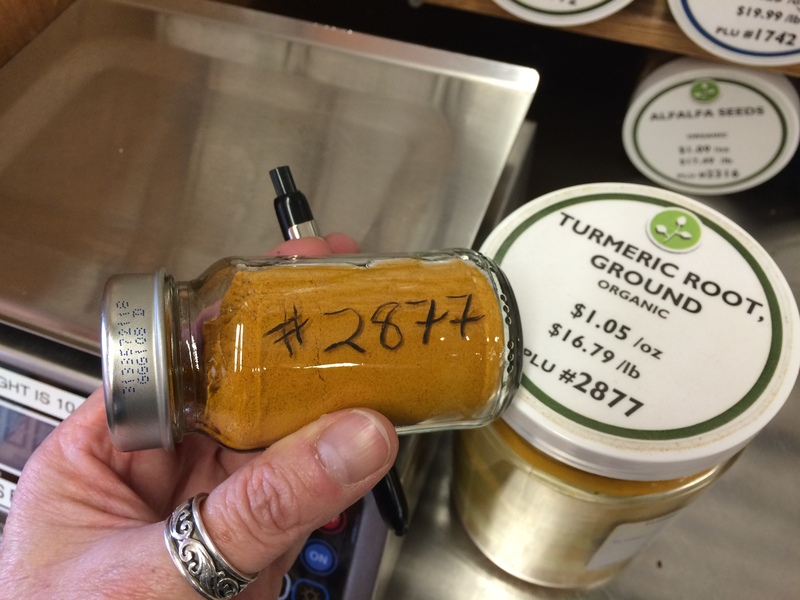 I usually use a grease pen to mark glass containers or use a sticker or twist tie provided for other items. On my bags I use the twist tie. It’s a bit odd, but it works. 7. Check out and pay. I usually ask to get my receipt so I can see how much things cost and compare with what they would have cost packaged. 80-90% of the time it is cheaper in bulk. See some of my comparisons below. 8. Go home and put things away. I often use the bags for beans, sugar, flour, etc., but once I am home, I transfer these items into a jar. 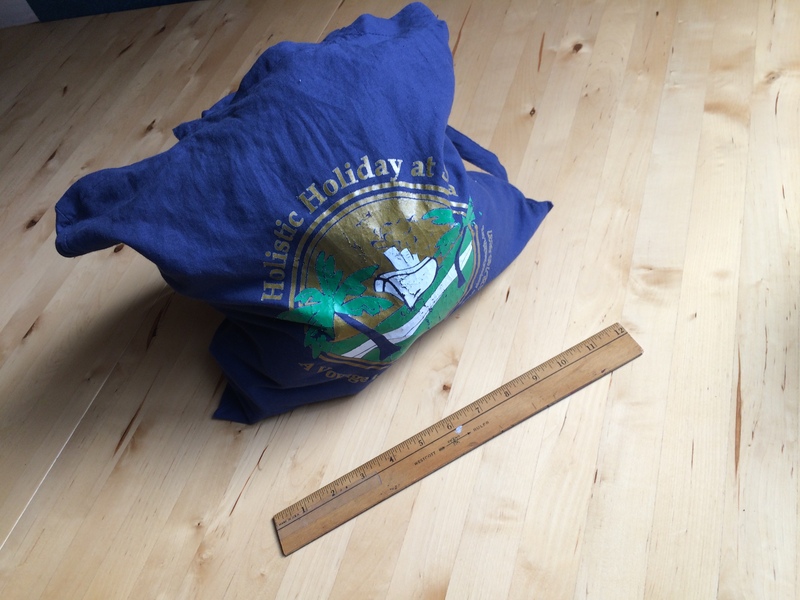 By using the bags it is less bulky in size and weight, making it easier to transport. I like that my bags are made of cloth, so I can easily throw them in the wash and once clean, put them back in the trunk of my car for next time. I have made the shift from packaged items to more and more bulk items over the past couple of years. 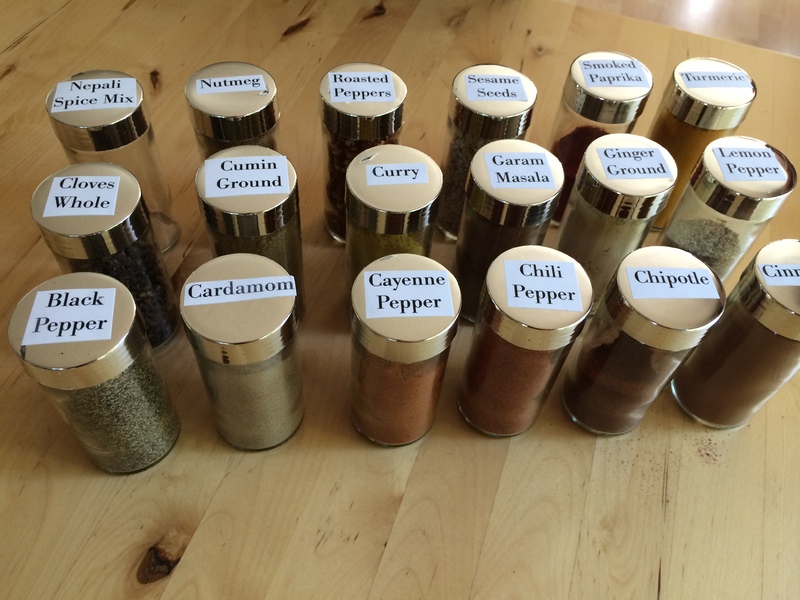 I gradually bought more and more in bulk and then got my kit of bags and spice jars together. If you look at the steps involved, steps 3-6 in the middle are different and take a bit more time. But, as you get used to it, I’d say for weekly groceries it may take me about 5-10 minutes more to shop this way than buying packaged items. Now let’s look at why I do this. 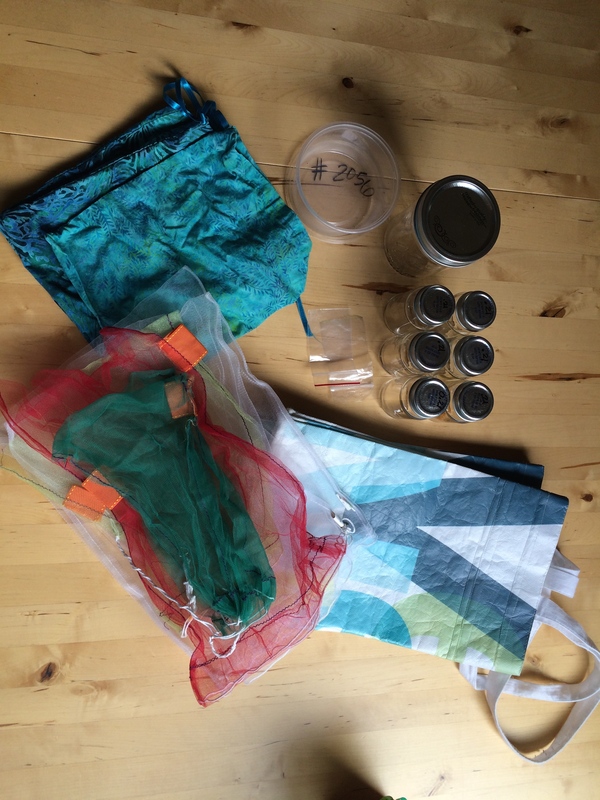 I originally began trying new ways to use less plastic after reading Beth Terry’s book, Plastic Free. 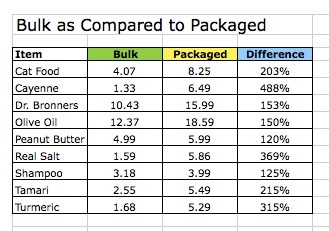 What I then found was I was saving money by shopping this way (see grid below, where difference is how much more packaged was as compared to bulk). And more recently a new discovery is that I am buying more whole foods, less processed stuff, thereby eating more healthy. 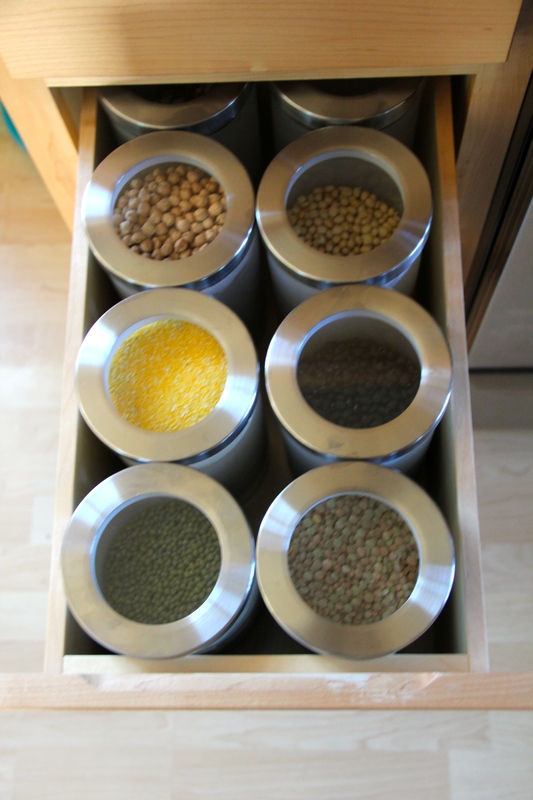 Minimalism has caused me to think, how can I simplify items in my kitchen pantry. I now buy raw nuts, seeds and grains and then toast the sunflower or pumpkin seeds, versus buying raw sunflower seeds and toasted. I now make my own almond milk versus buy cartons and if you read the label there are quite a few chemicals I’m avoiding in the process. And, I am now buying sesame seeds to make my own tahini. It works best for me by making one change at a time, incorporating that into my lifestyle, then seeing what’s next. So I hope this takes some of the mystery out of bulk shopping and that you will consider trying it. If you don’t know where to start, begin with spices. 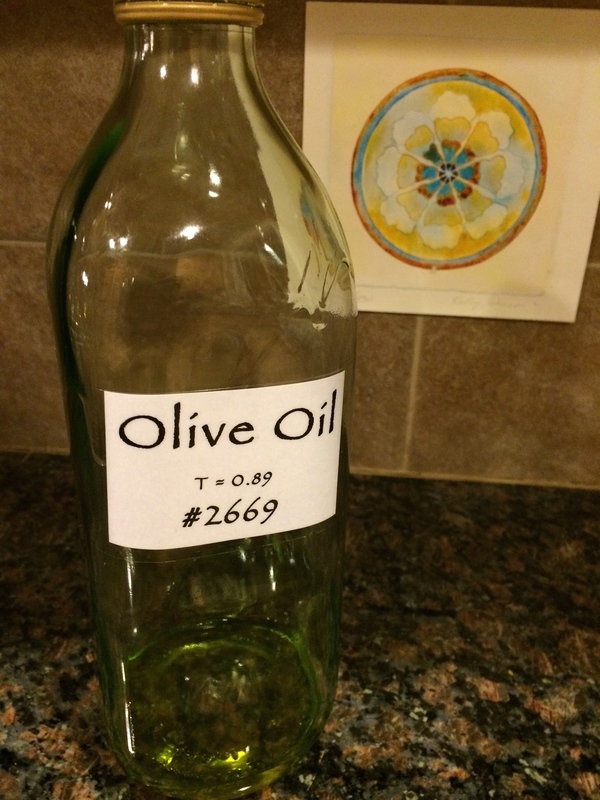 You only need to buy what you will use, so it’s a great way to try a new recipe without buying the whole bottle. If you liked this blog, consider “following” me by subscribing on my front page. That way you will be notified when my next blog comes out. I do not share your email with anyone. If you bulk shop, what other tips or hints do you have to add? Put your answers in the comments below. Really great blog post, Kat. You are a force of nature! This is excellent and very informative! 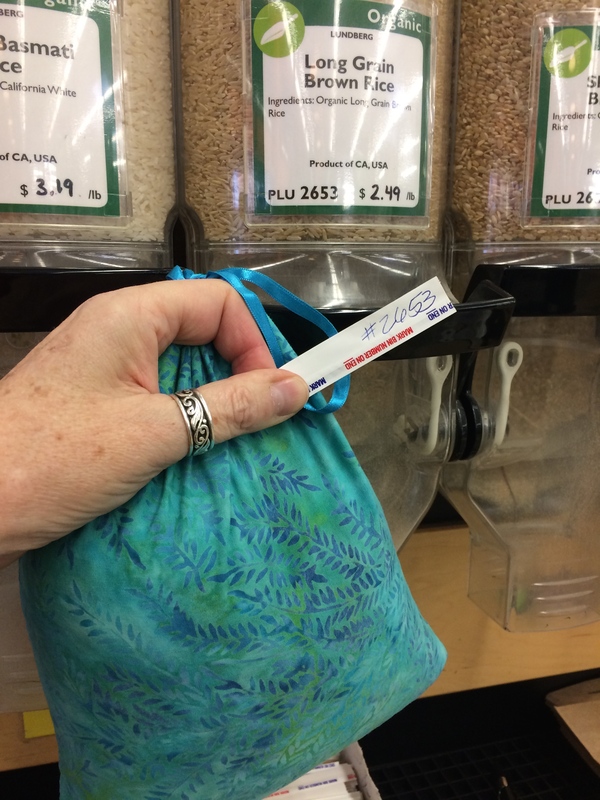 We buy spices and grains in bulk at my house, but we use the plastic bags they have at the store (which get reused at the store and for other purposes, so I don’t worry TOO much about the plastic). I didn’t even think about bringing your own container.